Metal Maker is the PUP that uses misleading techniques to prevent removal. Use Reimage to locate malicious components and get rid of them faster than with uninstall instructions. A full system scan blocks virus reappearance and prevents traffic to malicious domains. How can Metal Maker hijack my computer? 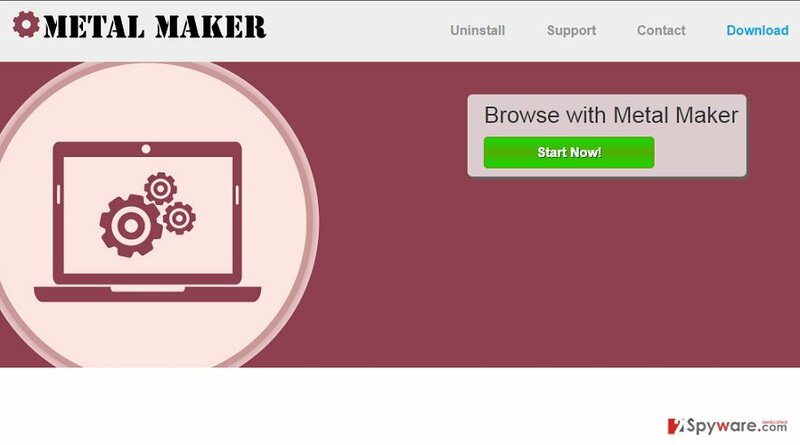 How to remove Metal Maker virus? Metal Maker is owned by SuperWeb LLC company, which is known for the development of adware-type programs all of which work in the same name, except they are named differently. Usually, adwares owned by this company have official websites and can be downloaded right there. However, people are tricked into installing suspicious apps bundled with other freewares. ‘Bundling’ is a tricky marketing method, which is used to spread third-party apps without users being aware of them. The main reason why people continuously end up installing bunches of programs without even realizing that is their inattentiveness when installing freewares. If you want to prevent installing Metal Maker redirect virus and prevent exposing your PC to various cyber threats, you should always select Advanced or Custom installation option and unmark ticks claiming that you agree with the installation of Metal Maker, Grassmow, Window Web, Simple For You and other questionable attachments. Of course, for hat you have to be very cautious and do not rush. In case your web browser has already been hijacked by a suspicious program, you should waste no more time and remove it from the system right away. In order to remove Metal Maker virus from your system, you have two options. Since it’s not malicious, most probably you will find its uninstaller in Control Panel. However, potentially unwanted programs commonly spread bundled with other unwanted apps, so we highly recommend you to scan your PC with a reliable anti-spyware and remove all suspicious programs from your system. Here, look for Metal Maker or any other recently installed suspicious programs. Wait until you see Applications folder and look for Metal Maker or any other suspicious programs on it. Now right click on every of such entries and select Move to Trash. When in the new window, check Delete personal settings and select Reset again to complete Metal Maker removal. Once these steps are finished, Metal Maker should be removed from your Microsoft Edge browser. Here, select Metal Maker and other questionable plugins. Click Remove to delete these entries. Now you will see Reset Firefox to its default state message with Reset Firefox button. Click this button for several times and complete Metal Maker removal. Here, select Metal Maker and other malicious plugins and select trash icon to delete these entries. Click Reset to confirm this action and complete Metal Maker removal. Here, select Extensions and look for Metal Maker or other suspicious entries. Click on the Uninstall button to get rid each of them. Now you will see a detailed dialog window filled with reset options. All of those options are usually checked, but you can specify which of them you want to reset. Click the Reset button to complete Metal Maker removal process. This entry was posted on 2015-03-27 at 00:41 and is filed under Adware, Viruses. You can quickly scan the QR code with your mobile device and have Ads by Metal Maker manual removal instructions right in your pocket. How did you remove Metal Maker ads?